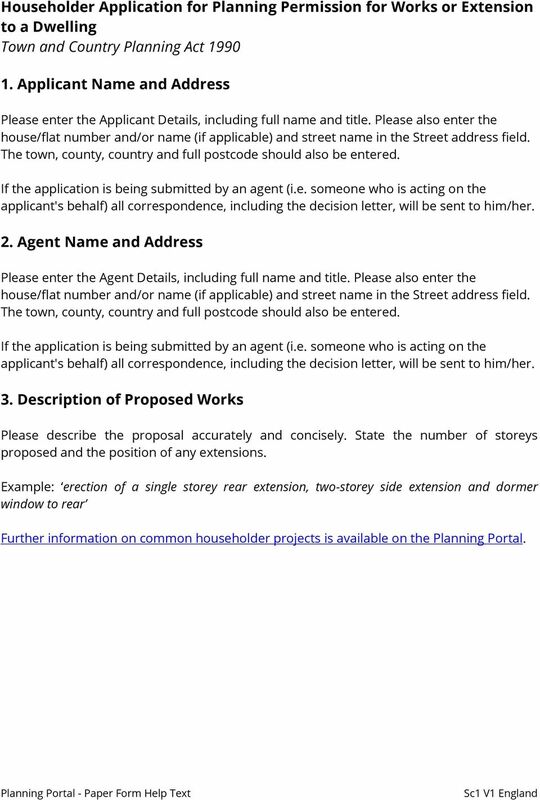 Download "Householder Application for Planning Permission for Works or Extension to a Dwelling Town and Country Planning Act 1990"
1 Householder Application for Planning Permission for Works or Extension to a Dwelling Town and Country Planning Act Applicant Name and Address Please enter the Applicant Details, including full name and title. Please also enter the house/flat number and/or name (if applicable) and street name in the Street address field. The town, county, country and full postcode should also be entered. If the application is being submitted by an agent (i.e. someone who is acting on the applicant's behalf) all correspondence, including the decision letter, will be sent to him/her. 2. Agent Name and Address Please enter the Agent Details, including full name and title. Please also enter the house/flat number and/or name (if applicable) and street name in the Street address field. The town, county, country and full postcode should also be entered. If the application is being submitted by an agent (i.e. someone who is acting on the applicant's behalf) all correspondence, including the decision letter, will be sent to him/her. 3. Description of Proposed Works Please describe the proposal accurately and concisely. State the number of storeys proposed and the position of any extensions. Example: erection of a single storey rear extension, two-storey side extension and dormer window to rear Further information on common householder projects is available on the Planning Portal. 2 4. Site Address Details Please enter the full postal address of the site. Enter the house/flat number and / or name (if appropriate) and street name in the Street address field. The town, county and full postcode should also be entered. If the application relates to open ground describe its location as clearly as possible (e.g. Land to rear of 12 to 18 High Street or provide a grid reference). When you submit a location plan, it is recommended that this is at a scale of 1:1250 or 1:2500, showing at least two named roads and surrounding buildings. The properties shown should be numbered or named to ensure that the exact location of the application site is clear. The application site must be edged clearly with a red line on the location plan. 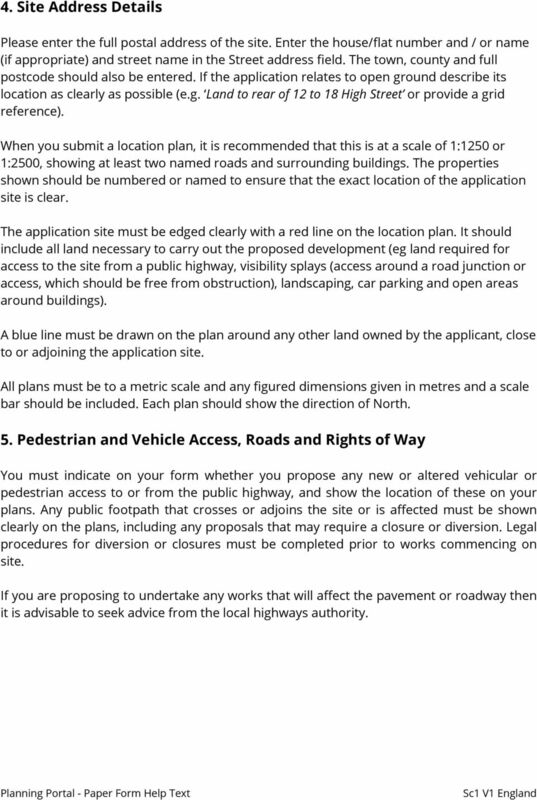 It should include all land necessary to carry out the proposed development (eg land required for access to the site from a public highway, visibility splays (access around a road junction or access, which should be free from obstruction), landscaping, car parking and open areas around buildings). A blue line must be drawn on the plan around any other land owned by the applicant, close to or adjoining the application site. All plans must be to a metric scale and any figured dimensions given in metres and a scale bar should be included. Each plan should show the direction of North. 5. Pedestrian and Vehicle Access, Roads and Rights of Way You must indicate on your form whether you propose any new or altered vehicular or pedestrian access to or from the public highway, and show the location of these on your plans. Any public footpath that crosses or adjoins the site or is affected must be shown clearly on the plans, including any proposals that may require a closure or diversion. Legal procedures for diversion or closures must be completed prior to works commencing on site. If you are proposing to undertake any works that will affect the pavement or roadway then it is advisable to seek advice from the local highways authority. 3 6. Pre-application Advice The local authority may be able to offer (possibly for a fee) pre-application discussions before a formal application is submitted in order to guide applicants through the process. This can minimise delays later in processing the application. Pre-application discussions can also help you and the planning authority identify areas of concern about your proposed development so that you can give consideration to amending your proposal before the application is submitted. The advice and guidance given to you at the pre-application stage is given in good faith. However, it does not guarantee or supply a definitive undertaking as to whether your proposal is likely to be acceptable. If you have received pre-application advice from the planning service please indicate the reference/date of any correspondence or discussion and the name of the officer. If you do not know these details then please state Unknown. 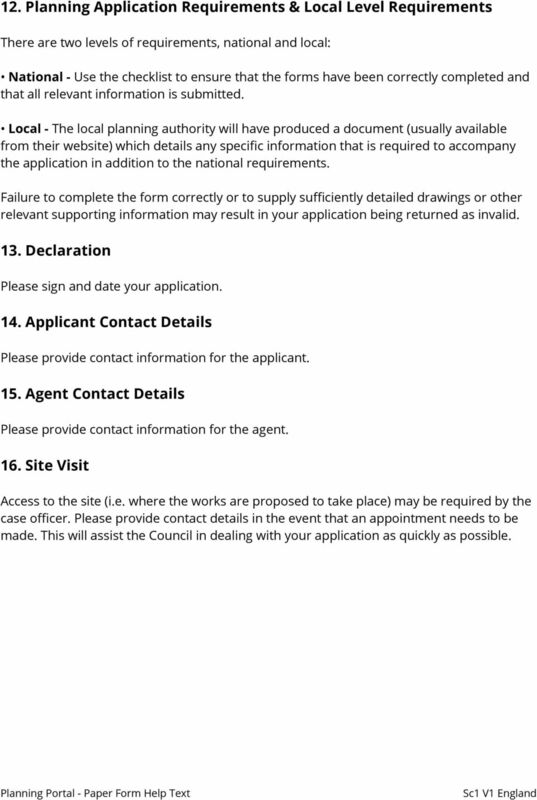 This will assist the Council in dealing with your application as quickly as possible. 7. Trees and Hedges Please mark on a scaled plan the position of all trees and hedges on your own property and those on adjoining land which are within falling distance of your proposed development (i.e. where the distance from the development to the trees and hedges is less than (or equal to) their height). This should include all trees and hedges that are within falling distance of any trenches or foundations that you propose to dig as part of the proposal. This information will help us consider how your proposal might affect these trees and hedges. If you know what species the trees are, please name them. Number the ones that you will need to remove or prune in order to carry out your proposal. Please Note: This is an application for planning permission. It is not an application or notification to remove or prune protected trees (i.e. trees which are included in a tree preservation order or located in a conservation area). If you are granted full planning permission, you will not need to obtain separate consent for tree works which are required to implement the planning permission. 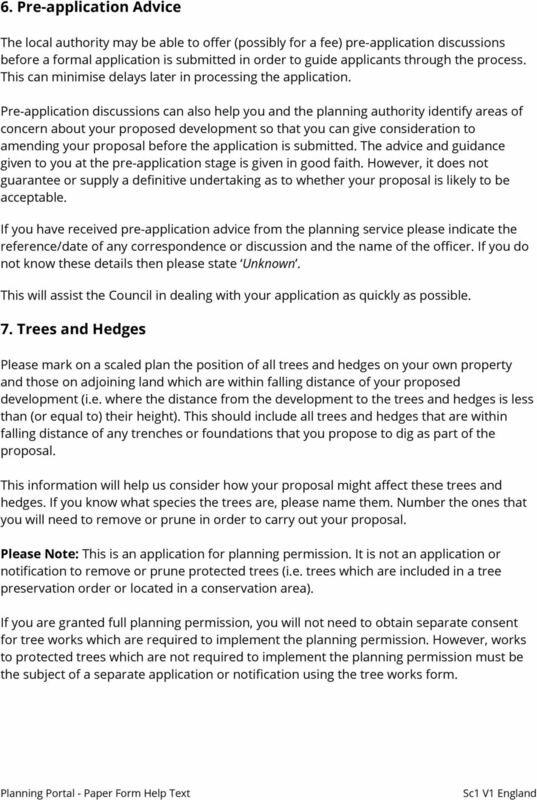 However, works to protected trees which are not required to implement the planning permission must be the subject of a separate application or notification using the tree works form. 4 8. Parking Please specify the total number of existing parking spaces and the total number of proposed parking spaces (including spaces retained) by vehicle type. Please include garage spaces. If no parking spaces are to be provided you should show on your plans or describe in a supporting statement where vehicles are to be parked. 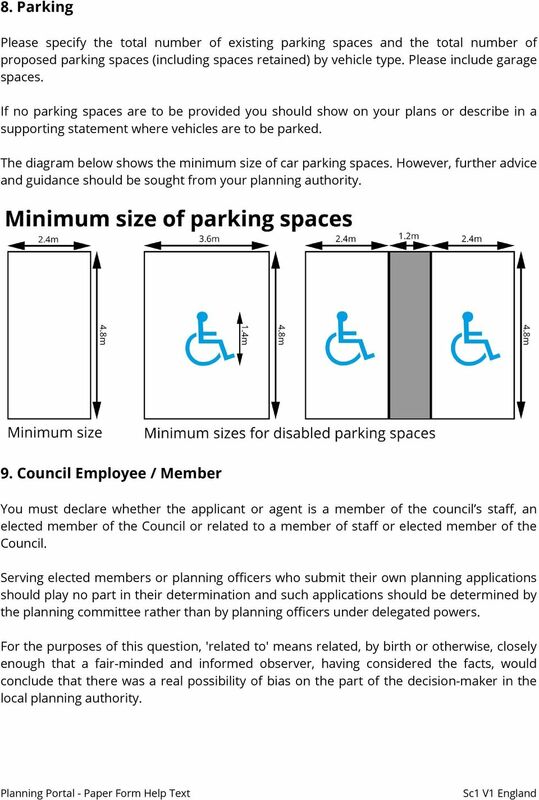 The diagram below shows the minimum size of car parking spaces. However, further advice and guidance should be sought from your planning authority. 9. Council Employee / Member You must declare whether the applicant or agent is a member of the council s staff, an elected member of the Council or related to a member of staff or elected member of the Council. Serving elected members or planning officers who submit their own planning applications should play no part in their determination and such applications should be determined by the planning committee rather than by planning officers under delegated powers. For the purposes of this question, 'related to' means related, by birth or otherwise, closely enough that a fair-minded and informed observer, having considered the facts, would conclude that there was a real possibility of bias on the part of the decision-maker in the local planning authority. 6 Certificate B - Shared Ownership (All other owners/agricultural tenants known) Certificate B should be completed if the applicant is not the sole owner or if there are agricultural tenants and the applicant knows the names and addresses of all the other owners and/or agricultural tenants (e.g. this certificate will need to be served if the proposals encroach onto adjoining land). The Householder Notice to Owners (Householder Application Notice) must also be completed and sent to all known owners/agricultural tenants. A copy of the notice should be sent with the application to the local authority. 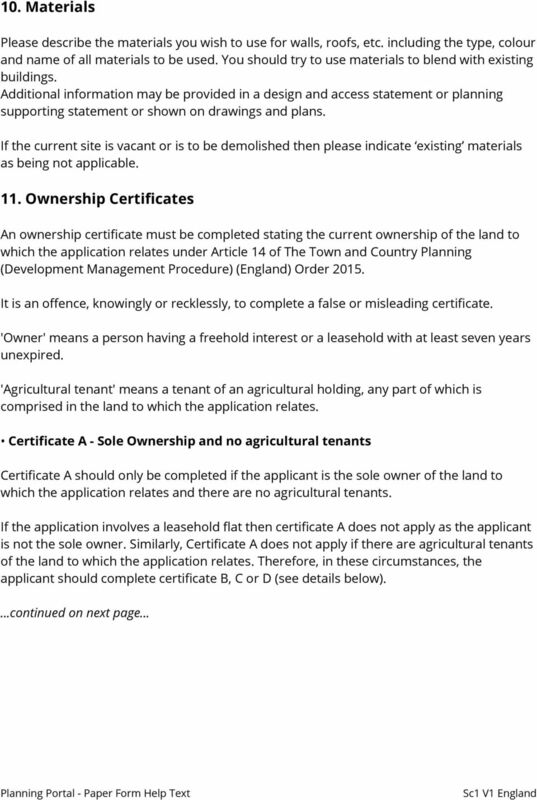 Certificate C - Shared Ownership (Some other owners/agricultural tenants known) Certificate C should be completed if the applicant does not own all of the land to which the application relates and does not know the name and address of all of the owners and/or agricultural tenants. The Householder Notice to Owners (Householder Application Notice) must be completed and sent to all known owners and/or agricultural tenants. 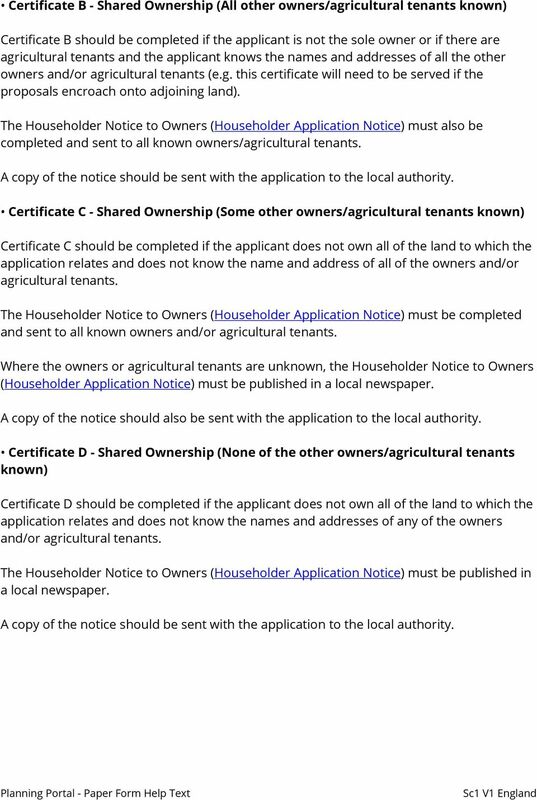 Where the owners or agricultural tenants are unknown, the Householder Notice to Owners (Householder Application Notice) must be published in a local newspaper. A copy of the notice should also be sent with the application to the local authority. Certificate D - Shared Ownership (None of the other owners/agricultural tenants known) Certificate D should be completed if the applicant does not own all of the land to which the application relates and does not know the names and addresses of any of the owners and/or agricultural tenants. The Householder Notice to Owners (Householder Application Notice) must be published in a local newspaper. A copy of the notice should be sent with the application to the local authority. 7 12. Planning Application Requirements & Local Level Requirements There are two levels of requirements, national and local: National - Use the checklist to ensure that the forms have been correctly completed and that all relevant information is submitted. Local - The local planning authority will have produced a document (usually available from their website) which details any specific information that is required to accompany the application in addition to the national requirements. Failure to complete the form correctly or to supply sufficiently detailed drawings or other relevant supporting information may result in your application being returned as invalid. 13. Declaration Please sign and date your application. 14. Applicant Contact Details Please provide contact information for the applicant. 15. Agent Contact Details Please provide contact information for the agent. 16. Site Visit Access to the site (i.e. where the works are proposed to take place) may be required by the case officer. Please provide contact details in the event that an appointment needs to be made. This will assist the Council in dealing with your application as quickly as possible. applicant's behalf) all correspondence, including the decision letter, will be sent to him/her. Please describe the proposal accurately and concisely. Provide details of all the uses/buildings proposed. SECURITY CAMERAS Building Security Planning Advice Note 1 Closed Circuit Television (CCTV) Department of Planning & Transportation Contents Introduction What do the policies mean? What needs to be considered? THE CORPORATION OF THE TOWNSHIP OF SPRINGWATER BY-LAW A By-law to regulate Signs and Advertising Devices in The Township of Springwater.